Earlier this year, I shared that I was giving up the idea of “real food and only real food” because it had become an unhealthy stress for our family. For a while, we struck a balance that I was very comfortable with — eating healthy foods most of the time with an occasional “cheat” product added in — frozen french fries as a side, crescent rolls to turn a meat filling into a complete dish, etc. Unfortunately, as things got busy this summer, the exceptions we made became the rule instead, and for several weeks I’m not sure we ate anything that was not out of a box or from a drive-thru. We could all feel the effects of our slide, and while we didn’t really feel like we had any other choice because we were in full blown survival mode, we have been anxiously counting down the days until we could get back on track. Last month I began working on the Kindle conversions for the Ultimate Healthy Living Bundle (which ironically contributed to our slide to this unhealthy place), and as I worked quickly through each of the real food recipe books, I found myself inspired again and again by the recipes. You see, real food can be hard, but it doesn’t have to be. There’s a lot of room between a diet of boxed, processed food and fermenting your own veggies. And the whole thing is a journey, not something you have to wake up and do perfectly tomorrow morning. Although I don’t love to cook, I’m trying to embrace it as more of a creative outlet that’s fun and fulfilling rather than daily drudgery. For me, that means trying new recipes, which I find much more fun than cooking our old standbys (although those standbys certainly have their place!). There are millions of recipes available on the internet, which can actually be pretty overwhelming. 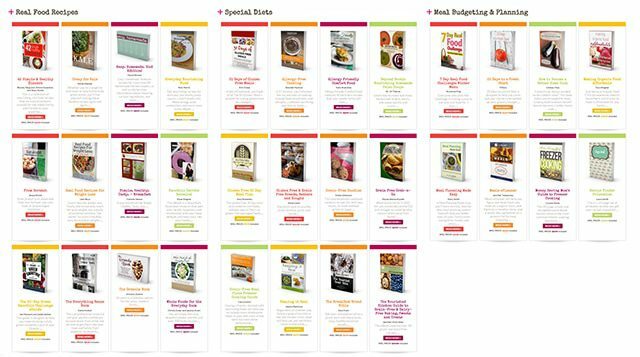 While I pin my favorites on Pinterest and add the ones I want to try to Plan to Eat, I’m excited to work my way through the cookbooks included in the Ultimate Healthy Living Bundle, knowing that they’re good-for-you recipes all compiled in one place, which means I don’t have to wait for pages to load, follow broken links or get frustrated by an incomplete recipe on the internet. For our family, preparing for the days when everything goes wrong is the key that we’ve been missing. When things get tough, we rely on quick, unhealthy meal options because our freezer and pantry aren’t set up to help us through those days. Honestly, I’m great at freezer cooking right before I have a baby, but there aren’t any more of those on the way, so I need to get it together to make it a more regular part of my routine. Whether you cook specifically for your freezer, double the meals you’re making anyway and freeze half for another day, toss ingredients into a freezer bag for a crockpot freezer meal, or stock your pantry with ingredients that can be thrown together at the last minute, preparing for the hard days eliminates the temptation to hit the drive-thru. I use Plan to Eat to plan our weekly menu and grocery list religiously (even when we’re eating junk!) because it makes it so much easier to grocery shop without worrying about missing a key ingredient. But what I’d like to do in the coming month is figure out a rhythm for our meal plan. We pretty much repeat the same breakfasts and lunches each week, and I think we need something like theme days (Italian on Mondays, soup on Tuesdays, etc.) to provide some extra inspiration for dinner. Another option I’ve considered is repeating the same plan every 4-6 weeks. This really appeals to me since I don’t enjoy sitting down to make the grocery list each week, but I’m not sure that offers me enough variety to keep me excited about being in the kitchen. Or we could go back to our once-a-month planning and shopping, which is a ton of work upfront but pays off in money and time savings for the rest of the month! At the end of the day, I think the key is to really be realistic: How much time do I have to spend in the kitchen? What kitchen skills do I already have? What would I like to learn to do this month? What do I find to be more hassle than it’s worth? Where should I make compromises? What do I want to prioritize? Taking charge of your health is an intensely personal journey. No one path is right for everyone, and if you try to follow someone else’s meal plan or food rules to “do better”, chances are you’ll fail. And that’s where the Ultimate Healthy Living Bundle comes in! This collection of ebooks covers a wide variety of topics, but the ones I’m most excited about are the food-related ones. With hundreds of healthy recipes (and hundreds of allergen-free recipes for those on special diets), plus ebooks about meal planning, freezer cooking, improving your kitchen skills, making healthy food affordable and more, it’s the collection of ebooks I need to makeover our eating habits once again. Plus, the Ultimate Bundles team knows that purchasing this many ebooks at once can be overwhelming, so they’ve put together an easy-to-use Getting Started Guide with a topic index and a book checklist to help you make sure you really utilize your collection. Grab your bundle today, because this sale only lasts a few days! 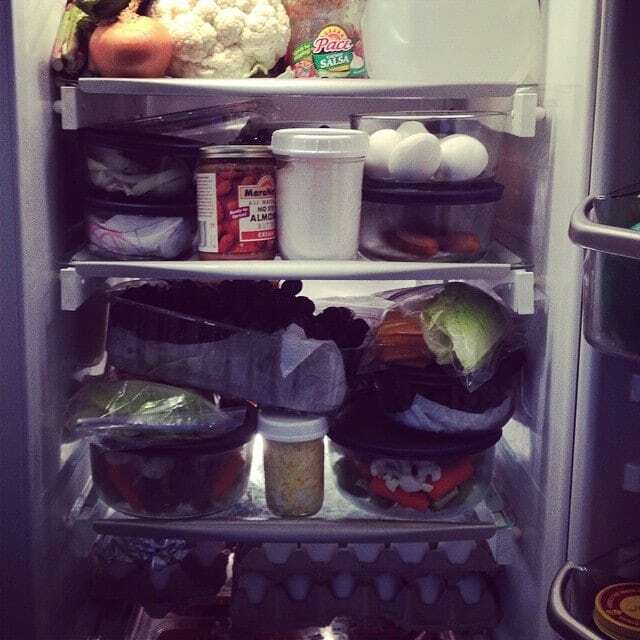 Our family switched to a whole foods plant based diet nine months ago and have seen huge improvements in our health. It’s been quite a challenge but getting easier as we adjust our life and learn. While I don’t miss drive thru food anymore, I sure do miss the convenience especially when my chronic back pain is flaring up. One thing I’ve found that really, really helps our whole family when dinner is late (or I don’t know what I’m making yet, lol) and everyone is super hungry I make sure all of us eat a healthy snack. Just some fruit, or a smoothie, or some sprouted whole grain toast with something healthy spread on it. It takes the edge off, we’re all feeling less grumpy and desperate, and we’re able to make better food choices or have the energy to make something after a snack. I use the same trick before going to a restaurant. If I go super hungry and then have to wait for my food I know that my judgement will be impaired, lol! Lol, forgot about my old disqus account. Whooops. Love that idea, Amy — definitely adding that to my bag of tricks! When I was growing up, my momma came up with 6 weeks worth of menus (nutritionally balanced, since she was a nurse) – although her menus were geared more towards just dinner. She put each dinner week in one column of a sheet of paper (2 columns per sheet) and placed that sheet into a plastic-covered “folder” that allowed her to write on the plastic with a grease pencil. If I remember correctly, she typed out 2 copies of each (yeah – no computers or printers back then ~lol~) so that we had 12 weeks worth in a notebook. She would write the dates by each dinner’s day of the week in grease pencil all through the book. At the bottom of each week’s column, she had a list of the ingredients (minus long-term staples like spices, etc) that were needed in total for that entire week’s dinner set. I remember that Thursdays were Mexican night (still my favorite to this day. ~grin~) – with mostly enchiladas and tacos repeating, but a wider variety of Mexican-themed dinners once I was in junior high and combing through all those food magazines and the weekly paper. Sundays were things like pot roast, pork chops, etc. Tuesday might have been pasta night – I remember things like mac-n-cheese and chili mac. When it was time to hit the commissary on base once a month, she would go through the up-coming menus for the next month and total up the foods we needed to buy. Then she had some formula for the cereals (all non-sugar varieties, much to my teenage dismay) , milk, cheese, bread, lunch meat, and fruits and veggies that she needed to buy – plus any spices or other long-term items that were running out. We didn’t eat out very much at all when I was growing up. So if it wasn’t bought at the once-a-month trip to the base commissary, it likely wasn’t going to get bought until the next monthly trip. Here’s what’s finally evolved in our house for “theme” nights. We make SOUPS(obvious), SANDWICHES (anything that is in a bun, bread, etc that you hold in your hand – even fajitas & tacos), CASSEROLES (anything that is jumbled up like Stir Fry Rice or traditional casseroles), MEATY (anything that has a “slab” of meat with sides – roast chicken, scrambled hamburger, pork chop, etc), PASTA/PIZZA (anything that is pizza or Italian-ish like Spahetti or Lasagna), BREAKFAST FOR DINNERS(eggs, French toast, etc), and SALADS(whole dinner style salads with meat on top). My Plan To Eat recipes are sorted into these categories instead of by “dinners” “lunches” or by meat type, etc. and we each take a turn picking something from each category that we’d like to eat in the next few weeks. I queue those and have dinners to plan for the next month that we all like. That way we know something we picked is coming soon. And for some reason it works out that there are always a few things that are quick and some that take longer to make, so we plan them according to our schedule. Love this, Julie — thank you so much for sharing!